Ever since he got his Honda Pilot 3 years ago, Costanza has been lamenting the fact that there was never an HID headlight option. For those who are unfamiliar with the term HID, think Xenon headlights or those-really-bright-annoying-lights-coming-towards-you-while-driving-at-night. Yah, those lights... Well, for awhile there, if your car did not come with them, the only option was to pay $1000.00 for a conversion kit. Now, for a low price of $58.00, you can install your own. So with my recent experience with installing them, he came over for some HID action (does that sound strange?). Of course with the boys in the garage, there was only one way we'd get dinner (you see, both of us do the cooking, the wives do not...), get takeout. Or in this case, order pizza from a nearby joint. 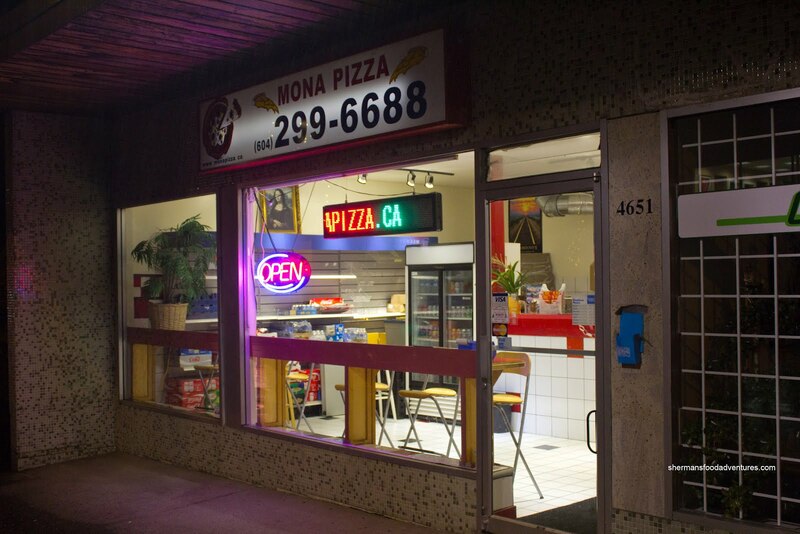 Seeing how we'd already tried Hot Oven and Stan's, we opted for another place nearby called Mona Pizza. I've always wondered why it was called "Mona". I assumed that was the owner's name. Nope. 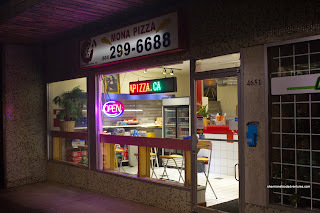 With a picture of the Mona Lisa on the wall and Mona herself eating a slice of pizza on the box, it was quite obvious where they got the name. Now the only question left was: would the pizza be a work of art or a fraud? Well, to get to the bottom of this, we ordered 3 pizzas starting with the Sausage, Mushroom and Ground Beef. 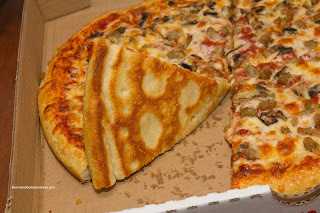 It was quite obvious by looking at the pizza that it wasn't going to be very oily. 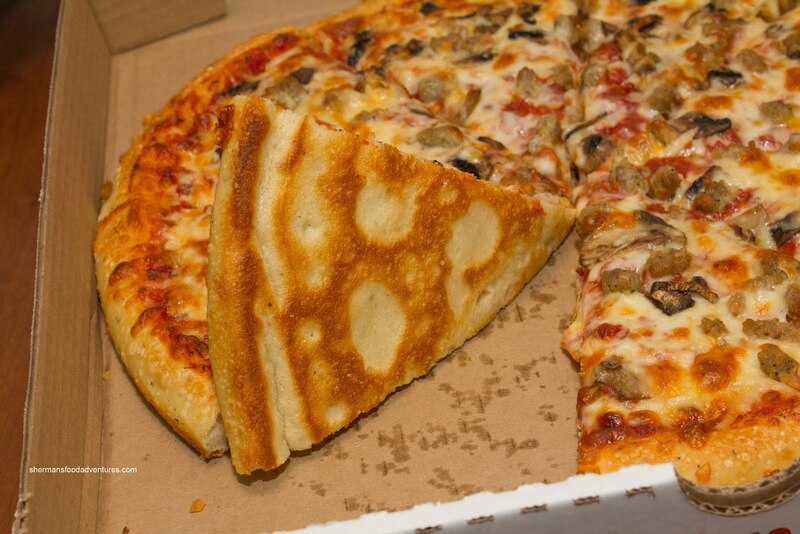 In fact, we barely noticed any oil on top or at the bottom of the pizza. Take that Pizza Hut! In the end, the pizza was slightly dry because of it. As you can see, there was a generous amount of toppings and a decent use of cheese. Usually, with the liberal use of toppings, the pizza would be fairly salty. Not in this case though, it was bordering on slightly bland. The crust was slightly doughy while crisp on the bottom and all around the edges. It stood up well and there were no soggy parts. 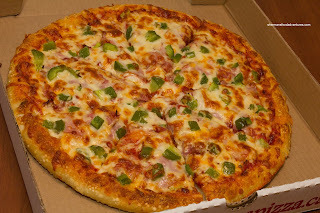 Other than the pepperoni pizza we got for the kids, our second one consisted of Capicola and Green Peppers. Again, whenever there is capicola, one would expect some spice. Not really, it was quite muted. Decent pizza, yet hardly memorable either. If I had to do it all over again, I'd go back to Hot Oven. 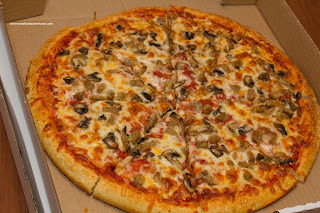 However, with all things considered (including price), Mona Pizza does the trick if someone wanted to get some pizza to watch the game or something. HIDs should only be used in projector style lights, using them in reflector style lights are when they piss off other drivers. As a compact car owner... *shakes fist!!! * You have now idea how many times I have been blinded by such type of lights. If it is a car that is coming towards me, sometimes I have to focus towards the right side of the lane so I can prevent blinding myself. HOWEVER, if the car is BEHIND me there is pretty much nothing I can do (keeping in mind the height of compact cars vs cars such as the Pilot, pretty much means the lights are hitting all the mirrors and reflecting back). As a result of this, I tend to drive slower so they get piss off and change lanes! Back to the food, I wonder if this is the same Mona Pizza I went to eons ago in Edmonds (a couple of blocks from Lhy Thai). If it is, then I will call their pizza serviceable. @KimHo Well, they are not as blinding if they are configured correctly (aka aimed properly). I always do that with mine.